As yoo know me fav flower is Dandelions, I loves dem cos dey like little suns in da grass, and wen dey go to seed da clocks iz like big puff balls. They looks fragile but they iz qwite strong. It takes a hard wind to blow da seeds away. So in defence ov da Dandelion me haz put togevva sum recipes using dem. All parts ov da Dandelion is edible, from da root to da leaf and flowers. And you can also make healing potions and creams wiv dem too. Dey nature's all round super hero! Every bit of the plant is edible: the young leaves can be used in salads (if yoo planning on eating the ones in yoor garden, yoo could blanch them by putting a pot over them to make the leaves pale and less bitter) or boiled as a vegetable. Try braising the dandelions with capers, chilli and garlic or make them into pie. Muvver sez yoo can use da leaves like yoo would use spinach wotever dat means. In autumn, when the roots are fat, they can be scrubbed, dried, roasted and ground to create a powder for making coffee, corse dey not taste like Costa Coffee but its very pleasant drink as long as you add sum drinkin chocolate to it before you drink it. Muvver pulled a strange face wen she tasted it so I fink dat means she didnt like it. 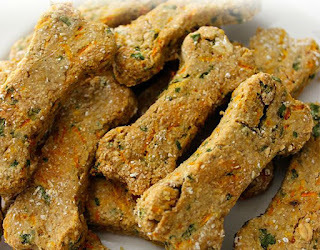 So here is da edible recipes dat we got togevva for yoo to try. Sum for hoomans an sum for furs. Muvver baked and tasted all ov dem, she ok she gets out ov hospital next week Bahahahahaha just teasin. Dey is all safe. She sez she dunt mind having hairy chest cos no-one see's it these days Bahahahahahaha ahem.... sorry I teasin agen. She gathered up all da yellow flower heads and made a risotto I fink she called it. Looked a bit like cat sick to me, but she said it weren't too bad. • First, prepare the dandelion petals. • Wash the flower heads in cold water to get rid of any insects, then cut off the end and peel back the green sepals like a huala skirt, freeing the petals. You'll need about 150g for four people plus a few extra as a garnish. • Saute an onion in two tablespoons olive oil with two cloves of garlic for about five minutes, but don't allow it to brown. • Add 300g of arborio rice. Stir into the onions and then pour in 125ml of dry white wine or pale, bone-dry rose. Once absorbed, gradually add a ladleful of stock at a time, allowing the rice to soak up the liquid before adding more. You'll need around 700ml. The rice will take at least half an hour to cook. • Add 125g of something creamy – fromage frais or yoghurt - plus 100g of grated parmesan and the dandelion petals. • Serve immediately, drizzled with olive oil and scattered with golden-yellow petals. Generously oil two 9-inch cake pans with coconut oil. Set aside. Combine the flours, baking soda, and salt in a bowl and set aside. In a large bowl, combine the oil, water/milk, vinegar, vanilla, and maple syrup until thoroughly blended. Slowly whisk in the flour mixture. Add in the coconut and dandelion pets and mix until just blended through. Pour the batter into the prepared pans (you will need two as it will overflow in one pan) and bake until the cake springs back when you press the center with your finger; about 30 minutes. Cool on a wire rack until you can handle it, then remove from the baking pans and cool completely. To prepare frosting, use a mixer or wooden spoon and beat the butter until light and fluffy. Add in the coconut oil and mix until thoroughly combined. Add the honey to taste (you may want more or less depending on your preference) and frost the cakes once cool. This will be a very loose frosting, so be gentle when spreading it on. 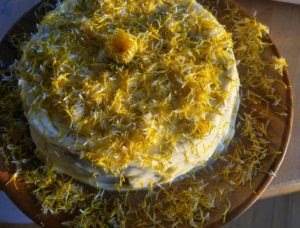 For decoration, gather extra dandelion petals or coconut flakes and sprinkle on the tops and sides. Enjoy! 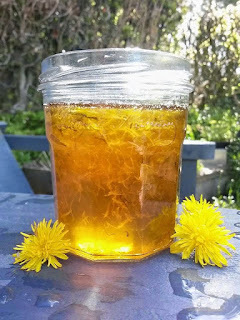 *Please only harvest dandelion flowers from a reliable area you are sure has not been sprayed with pesticides. Unfortunately this rules out most public spaces and roadsides, but dandelions abound in most nooks and crannies so happy hunting! And if you happen to have extra petals, they make a wonderfully bright and cheery sun tea. Simply place them in a jar filled with water and let it sit out in the hot sun for a full day to enjoy. 2. In separate bowl, beat sugar, dandelion syrup, oil and eggs together until creamy. 1. Pre-heat your oven to 170C. If you don’t have a silicon baking pan (highly recommended) grease, or line your cake pan of choice with parchment paper. 2. In a mixing bowl, combine your dry ingredients. 3. 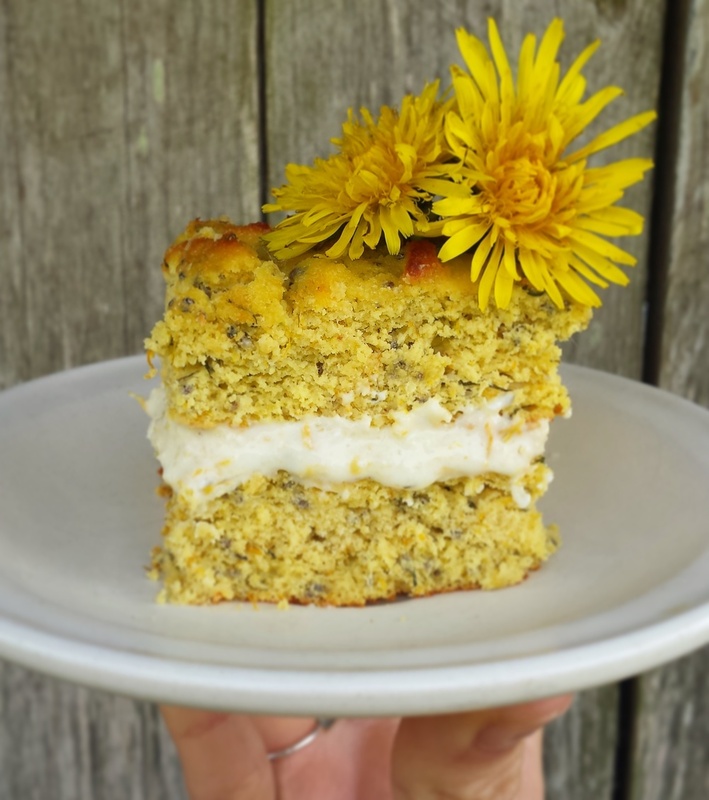 Add your Dandelion petals to your food processor with the Quark, coconut oil, egg, and lemon juice and zest. Blend. 4. Slowly add the dry ingredients to the food processor and give the batter a final short mix. 5. Pour into your cake pan, and bake for around 18-20 minutes, or until an inserted knife comes out clean. 6. If you would like to make a light but thoroughly delish topping, combine some more lemon juice and zest, Quark, icing erythritol and vanilla extract. 5. Top with butter and syrup. Grease a 28cm/11in round, deep pie dish with butter, then dust with flour. 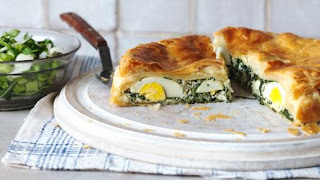 For the torta, place five of the eggs into a pan of boiling water and boil for ten minutes. Drain and place the eggs into cold water and leave to cool. Once cool, remove the shells and cut the eggs in half lengthways. Wash the spinach and dandelion leaves and shake to remove the excess water. Heat a large pan with a lid until hot, then add the spinach and dandelion leaves and cover. Cook for 4-5 minutes, until steamed and wilted down. Drain the spinach and dandelion mixture, and, once cool enough to handle, squeeze out any excess liquid. Roughly chop the spinach and dandelion mixture and place into a bowl. Heat a frying pan over a medium heat and add the olive oil and onion. Fry the onion gently for a few minutes until softened, then set aside and allow to cool. Add the cooked onion to the spinach and dandelion and mix well. Add the ricotta and parmesan and mix well. Add the provolone, season, to taste, with salt and freshly ground black pepper and mix well. Roll out about half of the puff pastry to 0.5cm/¼in thick and use to line the prepared pie dish. Fill the pie case with half of the spinach and cheese mixture. Add the boiled egg halves, yolks down, evenly spaced, then top with the remaining spinach mixture. 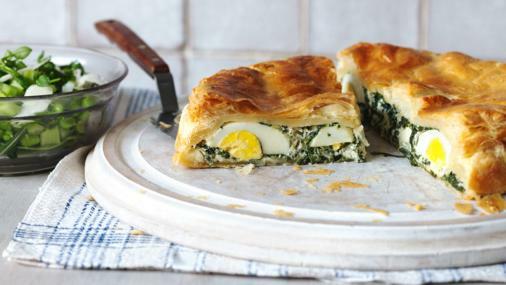 Brush the edge of the pastry with a little beaten egg. Roll out the remaining puff pastry to the same thickness as the first sheet, and place over the pie filling, pressing down the edges well. Trim away any excess pastry and crimp the edges with your fingers, so that the pie is well sealed. Make a small incision the shape of a cross into the centre of the pastry top to allow steam to escape during baking. Brush the top of the pastry with beaten egg, then transfer to the oven to bake for 35-40 minutes, or until risen and golden-brown all over. Remove from the oven and allow to cool. To serve, place a slice of the torta onto each plate and spoon some salad alongside. Drizzle everything with a little extra virgin olive oil and top with shavings of pecorino cheese. Pick fresh flowers, trim of stalk, if extra careful trim off all green. Put flowers in a large bowl. Set aside one pint of water, bring the rest of a gallon to a boil. Pour the boiling water over the dandelion flowers and cover tightly with plastic wrap. Leave for two days, stirring twice daily. Pour flowers and water in large pot and bring to a low boil. Add sugar and the peeling of the citrus (peel thinly and avoid any white pith.). Low boil for one hour, pour into fermenter. Add the juice and pulp of the citrus. Allow to cool. Add yeast and yeast nutrient, cover, and put in a warm place for three days. Strain and pour into secondary fermenter. Add raisins and fit fermentation lock. Strain and rack after wine clears, adding water to top up. Leave until fermentation stops completely, rack again. Two months later rack and bottle. Age six months to a year. Mix all ingredients together. The batter will be goopy. 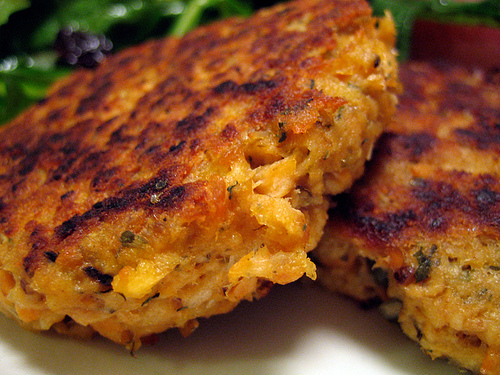 Form into patties and pan fry in oil or butter, turning until crisp on both sides. Makes 4-5 very nutritious vegetable burgers. Not bad but taste a bit like a regurgy... regur... reggae.... fur ball. Combine dry ingredients in large bowl, including petals making sure to separate clumps of petals. In separate bowl mix together milk, honey, oil beaten egg. Add liquid to dry mix. Batter should be fairly wet and lumpy. Pour into buttered bread tin or muffin tin. Bake 400F. Was ok she said it took a while to get it off roof ov hur mouf but she soon scoffed more ov it so werent dat bad. 1. Gently boil dandelion leaves in 6 cups water. Pour off bitter water. Boil gently a second time, pour off bitter water. 2. 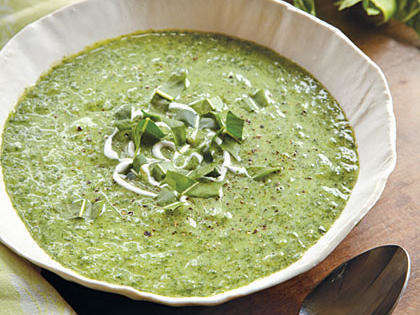 In a heavy-bottom soup pot, sauté wild leeks and garlic in butter or olive oil until tender. 4. Add dandelion leaves, flower petals, buds, and salt. Chop leaves into bite-sized pieces. Cook in boiling water until tender. Pour off water and taste. If they seem too bitter for your taste, boil again and strain. Bake whole pumpkin on baking sheet at 350° for 1 hour or until completely soft, so that you can put a fork or knife easily through it. Let cool. Cut in half and discard seeds. Rind will peel easily. 1. Sauté onion and garlic in oil or butter in a heavy-bottomed soup pot. 3. Add dandelion greens and pureed pumpkin to soup. Stir well. 4. Add salt. Cook at a gentle simmer for 30 minutes. 5. Just before serving add 1 cup heavy cream and ½ tsp nutmeg. She put loads ov dis in freezer cus it made a lot but she did taste it and sed it was lush and she woz smiling! 1. Put the nettles, dandelion leaves, burdock, ginger and thinly pared rinds of the lemons into a large pan. Add the water. 2. Bring to a boil and simmer for 30 mins. 3. Put the lemon juice from the lemons,1 lb. 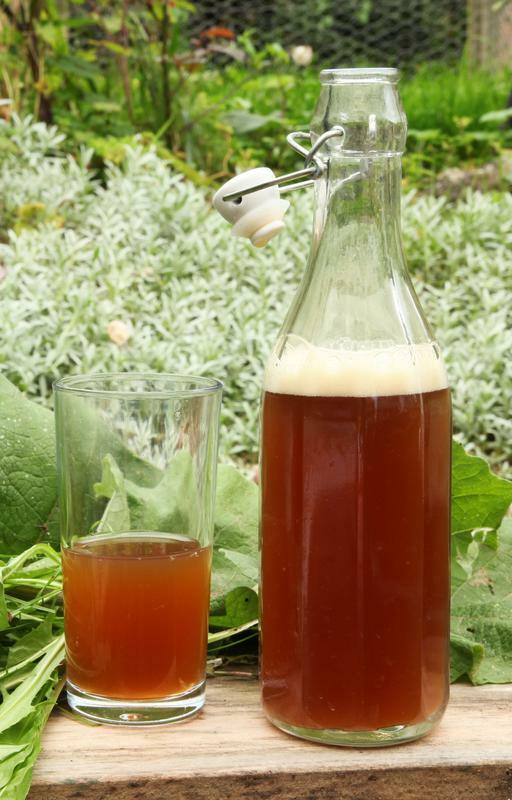 sugar and cream of tartar into a large container and pour in the liquid thru a strainer, pressing down well on the nettles and other ingredients. 4. Stir to dissolve the sugar. 6. Sprinkle in the yeast. 7. Cover the beer and leave it to ferment in a warm place for 3 days. 8. Pour off the beer and bottle it, adding t. sugar per pint. 9. Leave the bottles undisturbed until the beer is clear-about 1 week. Leave that little lot to simmer for 15-20 minutes, it will smell a lot like a health food shop, then strain through a tea towel, muslin isn’t really fine enough. Whilst the liquid is still hot you need to dissolve about 750g sugar. If you prefer is sweeter or ‘not-sweeter’ adjust the sugar. If you’re finding the drink a bit flavourless simply add more sugar, it accentuates the flavours of the roots and anise. In the summer mix it with plenty of ice and stir through borage flowers for the ultimate English soft drink! Enjoy. 1. Put the apples in a pan with 600 ml water and 55 g of the dandelion petals and bring to just below boiling point. Remove from the heat, cover and leave to infuse overnight. 2. Strain the liquid to remove the apple pieces and petals, return it to the pan and add the lemon juice and sugar. 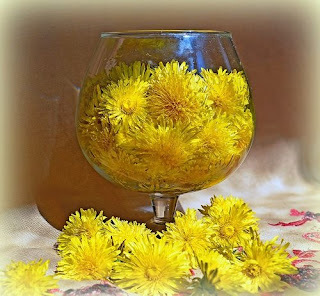 Stir over a low heat until the sugar has dissolved, then add the remaining dandelion petals. Boil rapidly until setting point is reached bear in mind that if you are not using jam sugar, the set will be soft. 3. Using a large spoon, remove any scum from the surface, then pour into warm, sterilized jars and seal immediately. If the petals are floating to the top, shake the jar once it is at room temperature to distribute the petals throughout the marmalade. She not tasted dis yet. Savin it she sed. 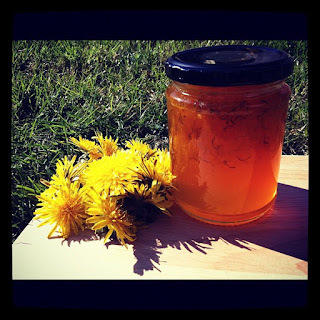 When finished, you should have a clear yellowish jam that smells like honey and tastes absolutely delicious! Pour the warm jam into warm, sterilised, dry jam jars. Pop on the lids, then label and date. Smelt lush even I wanted to taste it! The day before: harvest your dandelion flowers. You’ll need a lot! Pluck the yellow petals off and put them in a large pan with the water. Cook briefly and leave to stew, covered, over night. The day of preparation: Drain and reserve the liquid. Peel the lemon and slice. Add lemon slices and sugar to the liquid and bring to the boil. Boil until reduced to one third off the original volume. 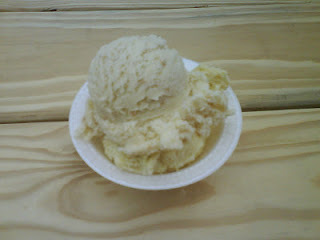 Test: take a spoonful out and allow to cool. It should have the consistency of honey. 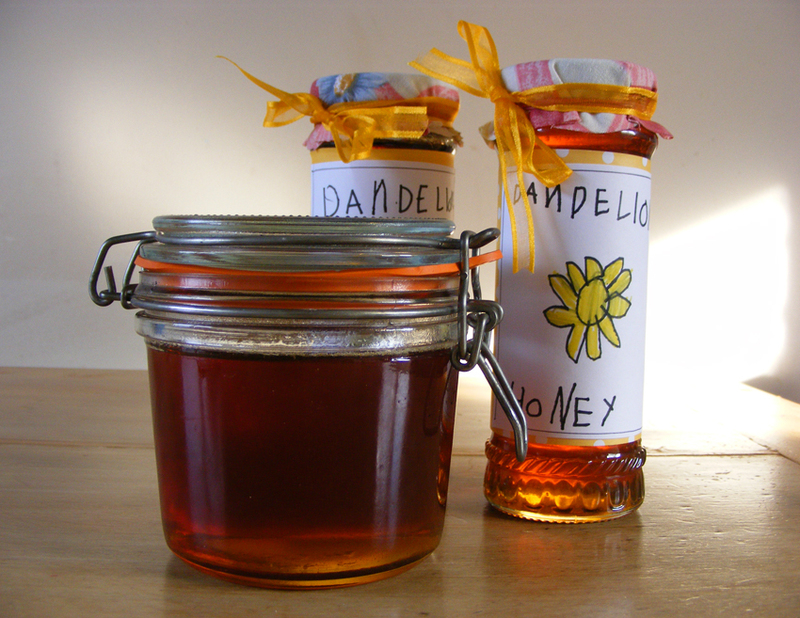 Sieve the honey into jars; seal and cool. Pour milk and cream into a pan, add the flowers and a pinch of salt. Bring to the boil, take off the heat and leave to infuse 1-2 hours. Mix together egg yolks and sugar until fluffy. Strain the milk, re-heat until warm and slowly mix into the eggs. Pour the custard back into the pan and slowly heat until it thickens slightly while constantly mixing. Churn in an ice-cream maker and store in the freezer. Put the flowers into an air-tight container. Bring the water to the boil and pour over the flowers. Leave to infuse 1-2 days. Strain the water, add the sugar and simmer for 2-3 hours until the mixture reaches the consistency of honey. Store in a sterilised jar. Dandelions be packed with vitamins and antioxidants and can even help with digestive issues, dandruff, constipation and skin problems. Dandelion is much more than just a weed. Add the chopped leaves to yoor dinner too so yoo gets all da vitamins and good stuff in dem wiv evfurry mouf full. 1. Preheat the oven to 300°F. Coat a baking sheet with cooking spray. 2. In a medium bowl, combine the flour, oatmeal, cheese, flaxseed, and dandelion leaves. Pour in the water and mix thoroughly to form dough. Flour a clean surface and roll out the dough on it. Cut the dough into shapes using a floured cookie cutter. Brush the biskits wiv beaten egg and sprinkle wiv dried dandelion petals. Use a spatula to transfer the biscuits to the baking sheet. Bake for 30 to 45 minutes, until the biscuits are lightly browned. Cool the biscuits on the tray, and store them in an airtight container. Ders farsands of recipes using dandelions as yoo can imagine, we juz shared sum here wiv yoo. Wen we got time we do anuvver dandelion feature using dem for ointments and creams and stinky baff stuff dat hoomans love. ere my sides is aching after dicktating all this an crackin jokes. Muvver...... MUUUUUUUUUVVVEEERRRRR get in da kitchen an start makin sum ov dat Dandelion Salve, I got an ache!